It was Eremar, first month of winter. The Festival of the First Snow, now surely but two or three days hence, would mark the passage of yet another year. While all the others in the village would gather in the great hall, hanging decorations and planning feasts, the young hero would sit alone on his uncle's porch, absent-mindedly drawing a whetstone across the old iron sword of his father. When creating a living, vibrant campaign world for your players, one of the most vital details overlooked by GM/DMs is a calendar of festivals, holidays, and special events. Holidays are more than just random occurrences throughout the year – they are absolutely integral to the cultural traditions and history of a people. By throwing in a number of special days and festivals, spaced intermittently throughout the year, you kill two birds with one stone. First, and most importantly, you have breathed life into your world, adding layers of depth and history where none may have existed before. Secondly, you now have a great number of quest hooks, scheduled events for your PCs to attend or miss, and an easy to remember time-keeping device for your campaigns. 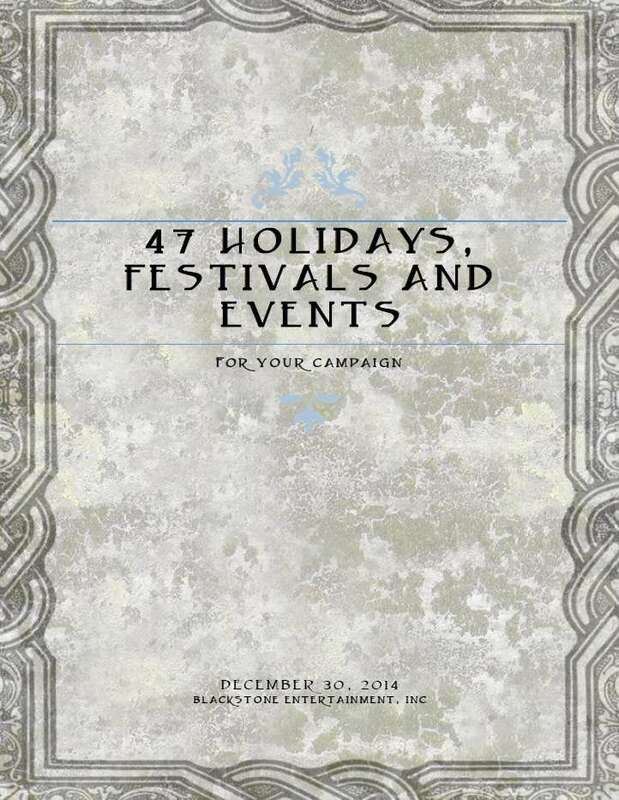 Included in the 47 holidays below are story and encounter ideas for every single festival and anniversary day – little plot hooks that can either be woven into your existing story or stand alone to become adventures and quests themselves! Feel free to modify any of the names of these holidays to suit your world’s history and geography, and try to fit them in with holidays and festivals you may have already created for your world! This title was added to our catalog on December 30, 2014.